There are those foods you must keep stocked in your fridge: for you it might be milk and eggs and a coffee creamer, mustard and mayo, soy sauce or kimchi. For us, it’s tortillas. 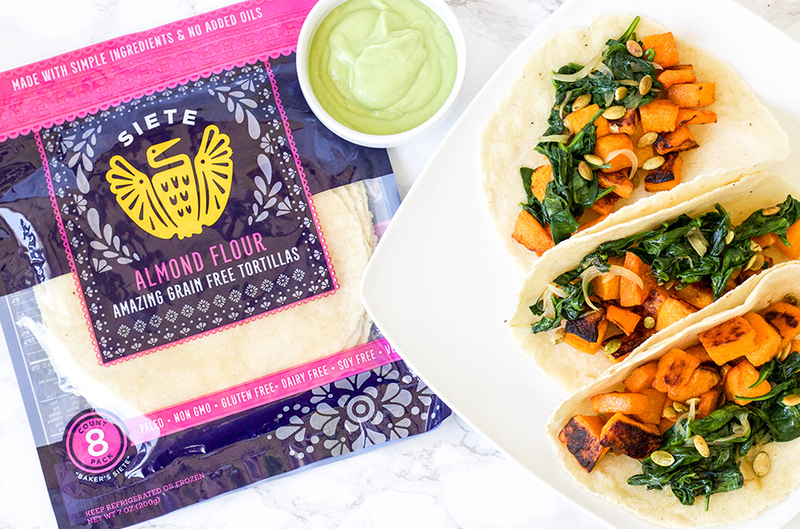 Sure we stock corn tortillas, but our must-have-available is a package (or three) of Siete Family Foods almond flour tortillas. We love these grain-free gems with beans, lentils, avocado, chicken, or veggies (see my butternut squash tacos, Sean’s favorite dish). Toast them a little longer, and they’re also fabulous as tostadas. And, with 3 grams of fiber and 5 grams of protein per serving (2 tortillas), they’re a healthy go-to to fill with whatever you desire or have on hand. I also love the product’s back story: their founders, the Garzas, are from my hometown of Laredo TX, and the idea for the tortillas came after one of the members was searching for a gluten-free alternative to the beloved flour tortillas so popular in South Texas. The Garza family used to sell the tortillas out of a cooler at their popular Laredo gym and today, Siete’s tortillas are found in Whole Foods stores across the country. You can also find them online at https://sietefoods.com, where a 6-pack sells for $55. The tortillas freeze well, but after one taco, you might find you’ll need to have them on hand in the fridge at all times.